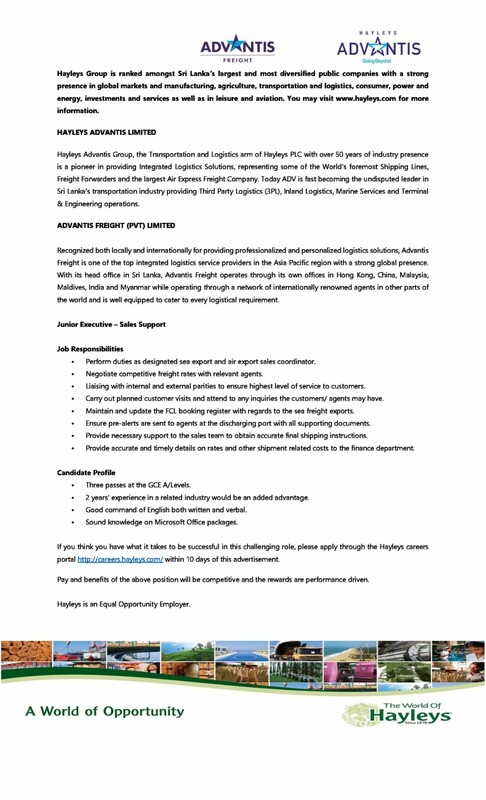 Job Responsibilities • Perform duties as designated sea export and air export sales coordinator. • Negotiate competitive freight rates with relevant agents. • Liaising with internal and external parities to ensure highest level of service to customers. • Carry out planned customer visits and attend to any inquiries the customers/ agents may have. • Maintain and update the FCL booking register with regards to the sea freight exports. • Ensure pre-alerts are sent to agents at the discharging port with all supporting documents. • Provide necessary support to the sales team to obtain accurate final shipping instructions. • Provide accurate and timely details on rates and other shipment related costs to the finance department. Candidate Profile • Three passes at the GCE A/Levels. • 2 years’ experience in a related industry would be an added advantage. • Good command of English both written and verbal. • Sound knowledge on Microsoft Office packages.